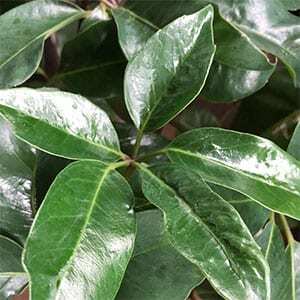 If you are looking for an easy care indoor plant, one that can take a little neglect yet still give you good glossy green foliage, then the Umbrella Plant is one to consider. The common name is from the growth habit of the foliage, like little umbrellas at the end of the stems. It is Schefflera Amate that is commonly known as the Umbrella Plant and this one is a cultivar. Chosen for its hardy growth habit and attractive glossy foliage this is just one of many Schefflera species that are available. Over time this forms a small to medium shrub. In a container it will reach around 1.5 metres in height. In the ground this is a larger growing plant that can get to 4 metres in height. Height will be determined by soil, climate and growing conditions. Coming from the tropical rainforests of New Guinea and Northern Australia, this is a plant that grows well in light shade. Direct sun will quickly cause leaf burn. With a good watering habit, never to wet, filtered light and regular fertilising and repotting this is a very long lived and robust plant. Like most Schefflera varieties, watering is the key to keeping the plant healthy. Although it likes moisture it does not like wet soggy soils. Try watering every 2 weeks. If the growing medium is good, this should be adequate. You can test the soil for moisture with your finger, the top 1/2 needs to be on the dry side before you water. You will need to repot every 2 years, simply because the potting medium tends to collapse and retain too much moisture. Use a free draining good quality mix designed for indoor plants. The best time to repot your Umbrella Tree is in spring. The time to start fertilising is in spring and this continues right through summer. You can use a slow release type fertiliser, or a liquid fertiliser such as fish emulsion, seaweed fertiliser or others. Leaves turning black along the edges. This is usually caused by overwatering, a tell tale sign is when the new foliage has black edges. It can also be caused by under-watering. These cause the leaves to become a little deformed. You can use a pyrethrum spray, or simply mist spray the plant to increase humidity.